In Brazil this summer there will be several players hanging up their cleats from International duty. So for them this will be their last chance at World Cup glory. It comes a time in a players career that they know, that their body and mind can't take the hours and work that goes into representing your national team. Some players have done it earlier than others, some have done it for personal reasons, conflicts with the coaches, or just no desire to represent their country and concentrate on their club career only. In Brazil, we will see four world class players most likely call it a career as far as representing their countries at a international stage. Out of those four, David Villa is the only one that has confirmed that this will be his last tournament with Spain and also the last time he will wear La Roja's jersey. He has won everything that there is to win with Spain including a Euro Cup trophy (2008) and World Cup trophy (2010). He has 91 caps for Spain and 56 goals, making him the top scorer in Spanish national team history, passing other players like Butragueno and Torres. He has also played for some of the largest clubs in Spain, including Barcelona, Valencia and Atletico Madrid with whom he won the La Liga title this past season. One of the games most lethal strikers, David Villa has been an icon of Spain's national team and an integral part of the squad. He signed this past week with the new MLS franchise, NY City FC, and perhaps that also played a part in his willingness to walk away from the national team. At the age of 32, Villa could still be productive for Spain at the next Euro's. but perhaps he feels like his body will need the extra rest if he is to have a longer club career. Miroslav Klose comes into this tournament looking for two different things, a World Cup trophy and a goal scoring record. This will be without a doubt his last chance at achieving both those goals, since this will be not only his last World Cup with Germany but also the last time he will play for his country. He hasn't announced his international retirement yet, but at the age of 36 it is obvious that his days of playing for Germany are in the past. Germany has a good young team and with talented players coming up from the youth squads is only a natural occurrence to see him set aside and let someone else take over his role. He is currently tied with the great Gerd Muller for second all time in World Cup scoring history with 14 goals, only one behind Ronaldo from Brazil. Out of the two goals he has set for this summers tournament, this is perhaps the most achievable one. I believe he will be able to not only tie Ronaldo but also set a new record, and be able to walk away from the national team with a sense of duty accomplished. Winning the World Cup will be a more difficult task to accomplish. Germany is in the group of death, but i believe they will finish first in the group and advance to the round of 16. I don't see them advancing more than quarter finals. He currently has 131 caps for Germany with 68 goals, tied with Gerd Muller for Germany's best goal scorer. If he breaks the World Cup scoring record he will also become Germany's best all time scorer, which really puts in perspective the international career Klose has had. Lampard is a world class player and a staple of English football. This past week he announced that he is leaving Chelsea, and it looks like he will be joining NY City FC of the MLS next summer. Rumors of him joining an MLS club have been around for some time now, but it looks like this time it won't be just a rumor. As he departs from Chelsea, he has also hinted at the fact that this will be his last World Cup and last time he will wear the three lions. 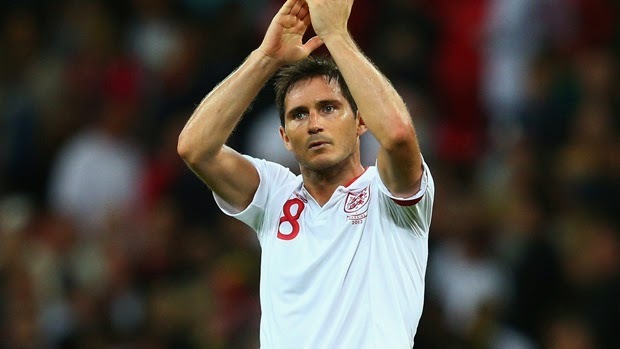 Lampard is 35 years old (he will be 36 on June 20th), so this is the obvious time in a players career where they tend to walk away from their national teams. This allows them to concentrate more on their club career and extend it for a few more years. England also looks to be in the middle of a generational shift, with a lot of youth coming into this years team it would be only a matter of time before Lampard was sitting on the outside looking in. It is always better to leave on your own terms than to be pushed out the door. Lampard has 103 caps for England having scored 29 goals. He has been very successful at club level but has never reached a semi-final of a major tournament with England. This is something that he would want to change in his last kick at the can. Pirlo at the age of 35 had one of his best seasons of his career playing for Juventus. He won Serie A, semi-finalist of Europa League and scored important goals along the way for his club. He seems to be just like a good wine, the older he gets the better he plays. Having said that, this will be his last World Cup, and with young players moving up from the youth teams he will most likely be playing the last games for Italy at this summers tournament. 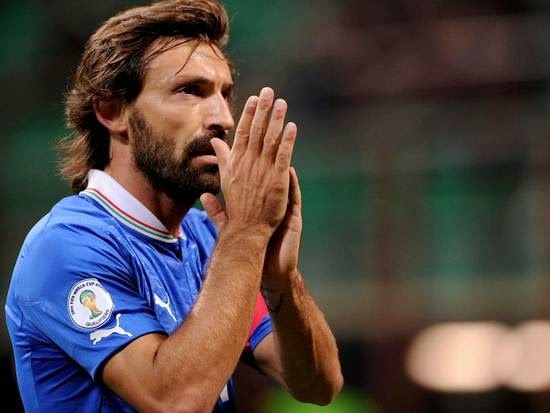 Pirlo has 108 caps for Italy and has scored 13 goals. His greatest moment with the Italian national team was winning the 2006 World Cup, in an intense final against France. He also won a bronze medal at the 2004 Olympics. He is a well respected played, not only by his team mates but also by his opponents. Marcello Lippi once said the following words about Pirlo "He is a silent leader, he speaks with his feet". That is the best description you can give when explaining to someone what he means to his teams. At this summers tournament he is without a doubt the heart of the Italian national team. He will be the maestro in the midfield dictating the play and speed of the game, and if give him a free-kick near the penalty box, he will make you pay for it. It will be sad to see him walk away from international play but for those following Serie A i believe we still have a couple more years to enjoy his class. International football will be a poorer once these four monsters of world football walk away from their national teams, but we all know that the time will come for all. We just have to enjoy this World Cup and the great moments that they will delight us with and ensure we record them in our very own memory banks. If not, you can always depend on youtube.